The landline phone is an important part of any household, and even if you don’t want one, you will find that most broadband packages insist on you paying for a landline – so you might as well make use of it. Plus, they are pretty handy to have around, especially when it comes to making calls to a number that would usually cost extra money on your mobile. The landline is better than you might think, and now could be the perfect time to get one. One of the most important things is to pick a landline phone that will be able to provide you with excellent audio and good volume levels. In order to help you find the best landline phone, we have put this guide together, compiling all of the relevant landline phone reviews in one place, so you can discover one that is going to be right for you. 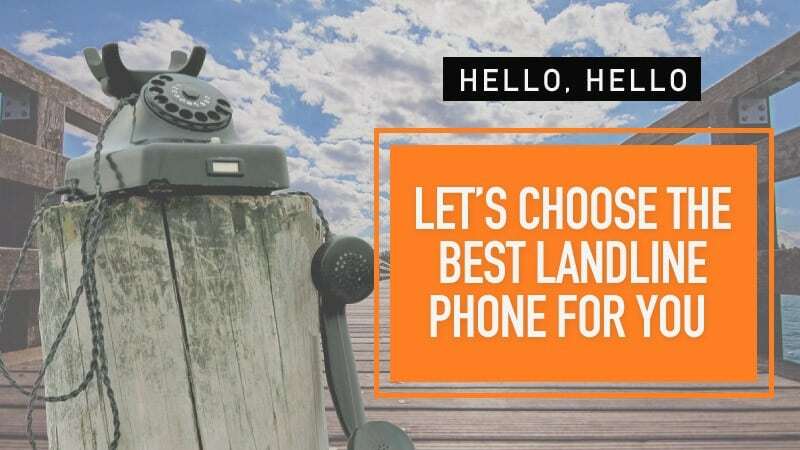 While the world of mobile phones has become vast and there are more types than you can count, the landline has remained incredibly simple, with two main types for you to choose from and the addition of special needs varieties. Here they are for you to read through. Corded landlines might seem a little retro or outdated, but they still do an excellent job and are often way cheaper to buy, which is great if you are on a really tight budget. They do tend to have a speakerphone function, and while they are not as flexible as cordless landline phones, they will still work if you find yourself in the middle of a power outage – which is a massive benefit. Cordless landlines are currently the most popular and widely used form of landline phone. They are incredibly flexible and come at a range of prices, which will ensure that you can find one to suit almost any budget. You also have the benefit that many cordless models come with multiple handsets, which is great for larger homes. The only real issue they have is that they don’t work during a power outage. 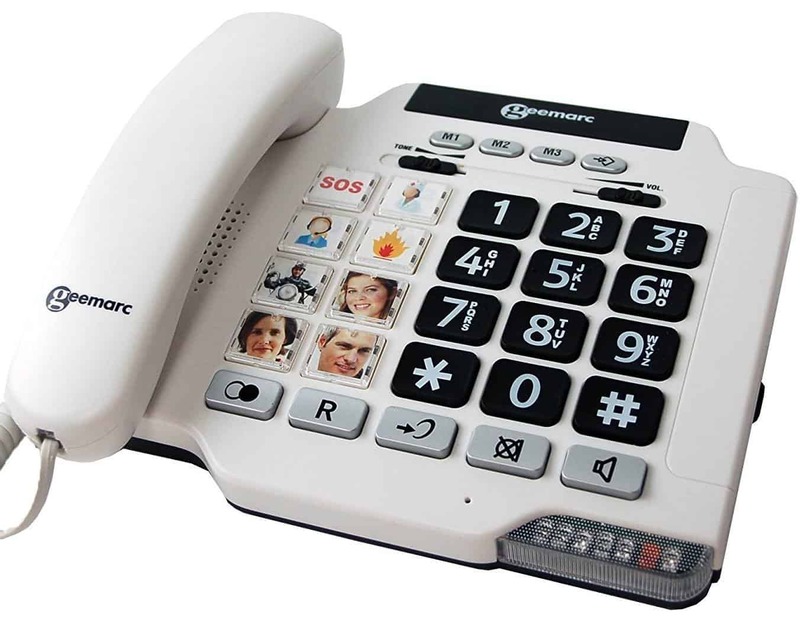 Special needs landline phones are great for those who are elderly, or those who have hearing/visual impairments. Often, adjustments have been made according to the need that has to be addressed Things like larger numbers or specialised volume controls that work specifically with hearing aids. There are a number of them on the market, so you are sure to find one that suits you perfectly. Now that you know more about the types of phone available, take some time to read the landline phone reviews below to see which one is right for you. BT is one of the biggest brands when it comes to telephones, especially landlines. As an internet and telephone provider, you can expect to see great quality from this brand. Have a read of the reviews below and see if this is the right landline phone for you. This landline comes in black and has a classic design. While it is a single handset, it is possible to purchase it as a twin pack, which is great for larger homes or those who have a home office. It also has an answering machine, so anyone who misses you can leave a message at their convenience. The number keys are illuminated and have a confirmation tone. It is type II caller display compatible, and the phone book will allow you to save the contact details of up to 50 people. If you need to redial, you can scroll through the last 20 numbers that you called, ensuring that you find the right one. Plus, the screen has a clear display and backlight so that you can see at all times. It doesn’t come with speakerphone, which some customers found disappointing. This landline phone comes from a very reputable brand and at a fantastic price, so if you are on a budget you won’t need to stretch it in order to afford this model. While it does not come with speakerphone, and some customers have found this disappointing, it does have a great range of other features – including contact saving and an excellent answering machine. It’s a brilliant model to go for, and it comes at an equally great price. Q: How long approximatly does the battery last on this phone? Phillips is another big tech brand, and whether you own one of their televisions or washing machines, the quality is still the same. If you are in search of the best landline phone on the market, you might not need to look any further. Have a read and see for yourself. 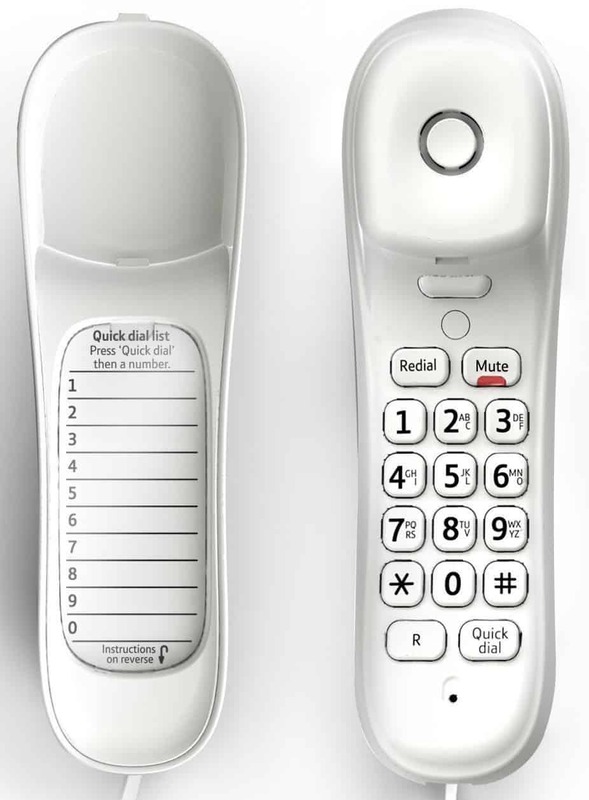 This landline phone comes in white and has a sturdy design. It comes in a twin pack, but you can also choose a single one if you don’t need the extra handset in your home. It includes an answering machine that lasts up to 30 minutes, giving you more than enough space for all of those missed calls. You also have the added benefit of a one-touch volume boost for extra sound. The display is extra-large, which ensures for easier reading, and you will find that the keypad and number are also bigger, as well as the characters on the screen. This model also ensures that you retain your privacy, with advanced settings like blacklisting, call barring, and a do not disturb mode for when you really don’t want any calls. Some customers found the voicemail service tricky to set up, but once it was done there were no issues. Paying extra for white phones has always seemed to be the way the market works, but they can blend in beautifully with a modern white home. While the voicemail was a little tricky for some customers to set up, once it was done there were no other issues on the whole. It comes with a great range of features for your privacy, and the large keypad makes it easier for you to type the number in. An overall great buy. Panasonic is a big name in the technology industry, and it’s one that most people have heard of. If you are looking for a landline phone that is budget in terms of price but still works fantastically, this is the one for you. Take some time, have a read, and see if it’s right for you. This landline phone comes in black, and is a twin set. However, if you want a single handset for your home, or even a triple pack, there are options for you to pick those up as well. It has a great answering machine so that you can listen to the messages left by those you missed calls from. It also features a one-touch echo mode and a confirmation tone. The contact list in the phone is able to hold the name and number of up to 50 contacts at any given time, and it also features a hands-free speakerphone setting for when you need to get on with other tasks while on the phone. For your privacy, you are able to block numbers - whether they are specified or withheld. The display is large, illuminated, and easy to read. Some customers found that the volume was a little low when answering calls and speaking to people. This landline phone comes at a budget price, especially for a twin pack, and one that you will find hard to resist. While some customers did find the volume a little low, these are few and far between, and the speakerphone option can help to increase the level of sound if needed. It has a great range of additional features, especially when it comes to your privacy, and the illuminated display will ensure that everything is easy to read. The corded landline is not as retro as you might think, and they can prove pretty handy when it comes to things like power outages. 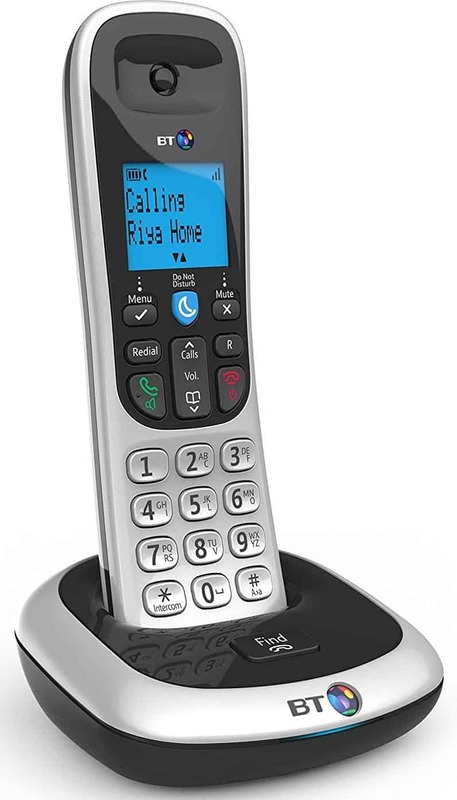 Another great model from BT, this corded landline could be just what you were looking for. Read the reviews below and see for yourself. This corded landline phone comes in white, which will blend in beautifully with any home and its aesthetics. Plus, it sports a sleek and modern design that sets it apart from other corded phones. It can even be mounted on the wall to keep it out of the way and keep your home looking nice. It’s also really simple to use and comes with great instructions. It can save up to ten numbers in its memory and has a quick dial feature that allows you to call your favourite numbers with speed. It also allows you to redial the last number you called, and has a mute feature just in case it is needed. There is also an LED indicator that causes a flashing light when there is a call – which is good for those who are hard of hearing. Some customers feel that the base is too lightweight and that it falls off the counter very easily as a result. This landline phone comes at an amazing price, and because it is a corded model it has a great level of reliability during a power outage. So, whether you purchase it as your main phone or a backup one, you can rest assured that it will serve you well. While some felt that the base was too lightweight, a gentle touch is all that is needed to rectify this issue. It comes with some brilliant base features, and for the price, it’s the best you can get. Whether you are looking for yourself or an elderly relative, having a landline phone that has been adapted to kake things easier for you can be a realy lifesaver. This model from Geemarc has everything you need, so have a read below and see what you think. 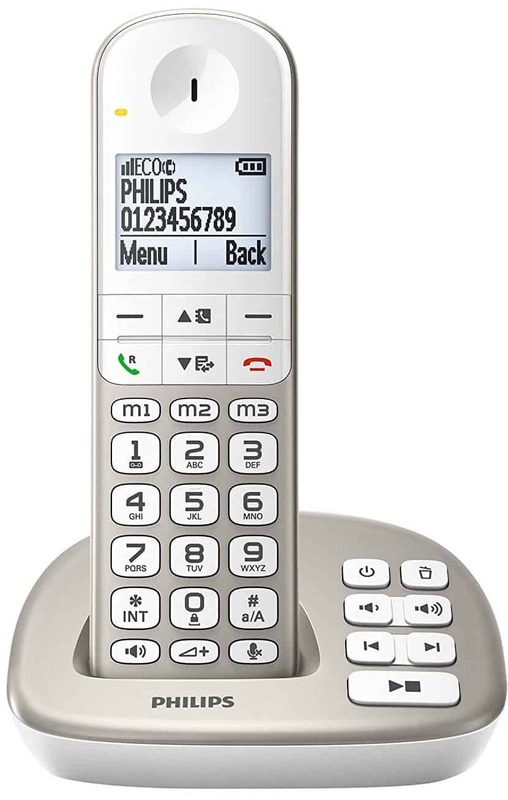 This landline phone comes in white with black buttons and a great design that won’t stand out in your home – so if you don’t want an obvious landline, this one has you set. The black keys are very large with clear white writing, ensuring that you are able to see each of the numbers clearly, and also making for easy pressing. It even has eight photo ID memory buttons that can be changed and customised at any time to help you remember the most important contacts that you have saved. The ringer volume can be adjusted up to 8db, with the receiving volume adjustable up to 30db for better listening. There is also a speakerphone option. Plus, there is a visual ringer indicator if you are hard of hearing. Some customers found that the ring was not quite loud enough for their needs. 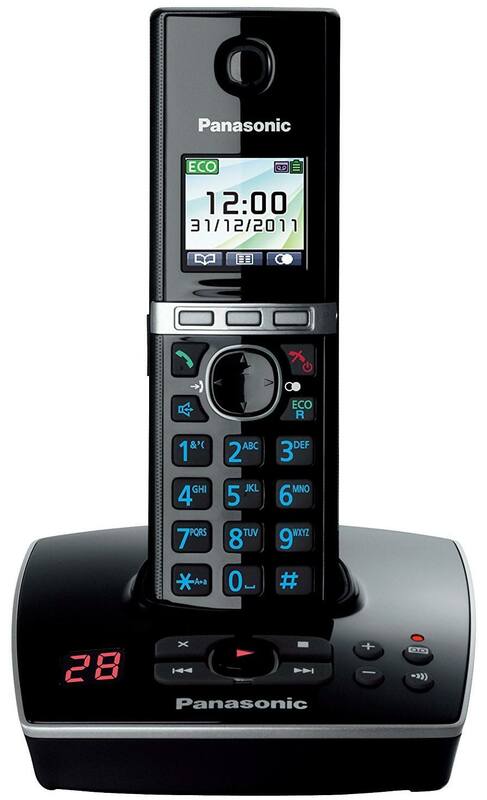 This corded landline phone is cheap and excellent quality, as well as great for the elderly or those who have visual/auditory impairments. While there were some customers who found the ring was not quite loud enough for them, it is down to individual cases where some can hear better than others, and so it is best to experience it for yourself. It has some great features, like the photo ID for the quick dial feature, as well as being simple to use. 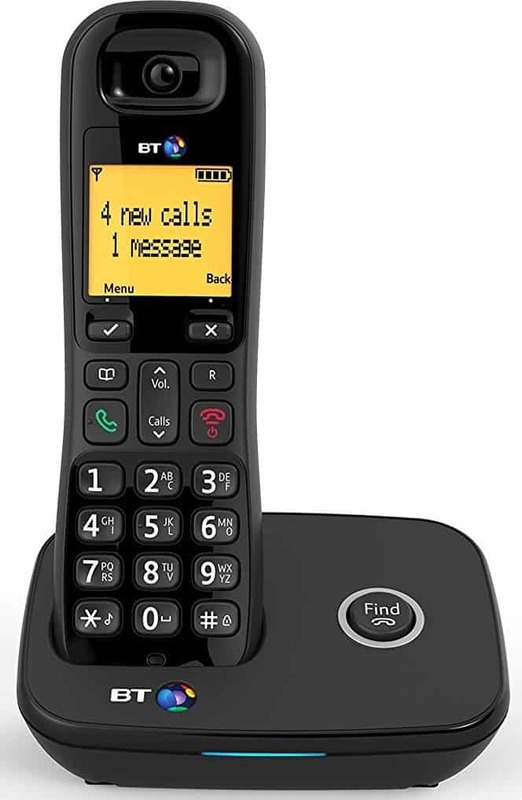 Another great model from BT, this cordless landline phone is not only available at a budget price, but is perfect if you tend to receive nuisance calls. It has the ability to block up to 50 phone numbers that you don’t want to hear from – whether it’s cold callers or people you really don’t want to talk to. It will also allow you to see and hear if you have a second call waiting, and you have the ability to redial the last ten numbers that you made calls to. The screen is very easy to read and has a clear display, and it can save up to 50 contacts in its memory. You can also purchase it in a twin pack if you want more than one handset. 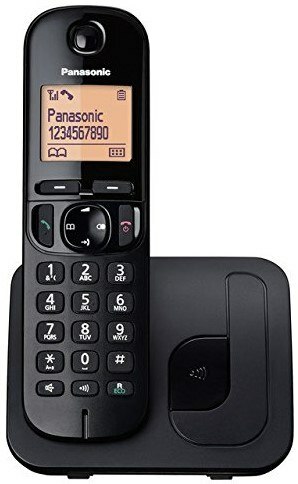 Going back to Panasonic, this twin set of landline phones comes at good price and includes a main handset as well as a second one that can be placed anywhere in the home. The phonebook is massive, allowing you to store up to 200 contacts at any given time. The display is high resolution and very clear, so you can see all of the key information you need at all times. Plus, it has caller ID and an 18-minute answering machine, which is perfect. The volume is adjustable, and you also have the option to use the speakerphone setting.